Ellen Van Loy looks cool with a Flatirons background. Ellen Van Loy came on a lark and ran away with the win. 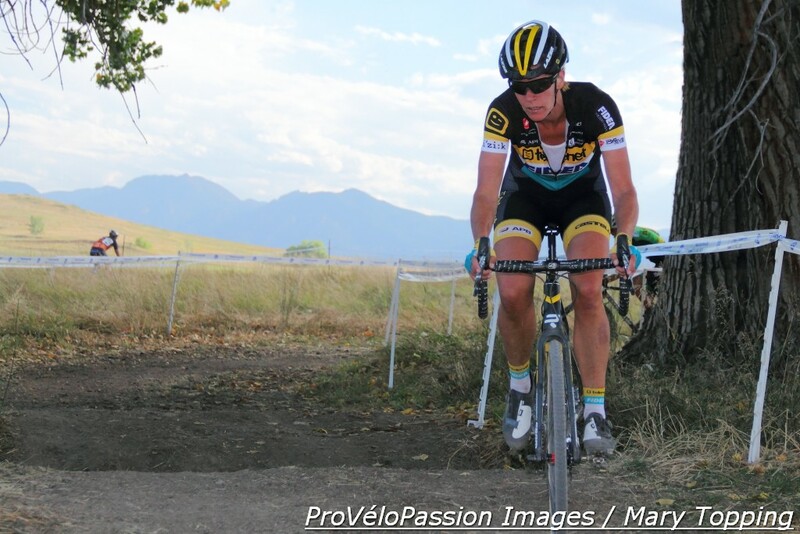 While staying in Boulder with her Telenet-Fidea Cyclocross Team for training prior to America’s first World Cup cyclocross event at CrossVegas, Van Loy dropped in on the first local cyclocross race of the season. The free-style event scheduled C, B, and A classes; the Belgian visitor entered the women’s A race which began one minute after the men’s A start. After a fast rush to the first corner led by masters national champion Kristin Weber (Boulder Cycle Sport), Van Loy took the lead on a dusty track where the temperature rose to a sunny 35 Celsius. Meredith Miller (Noosa Professional Cyclocross Team) finished second and “retired” Nicole Duke placed third. Local riders like Melissa Barker (Evol Racing) felt the stretch required by the extended length of the women’s competition set by the non-sanctioned event. “It’s hot and it’s 15 minutes longer than we normally race and I’m pretty tired,” she said as she tried to cool down in the shade by an inviting pond. Earlier in the afternoon, close to 400 athletes participated in the C and B races. That built a considerable mass of spectators for the elite races. Van Loy enjoyed her share of the heavy heckling that ensued at the top of the steep run-up. While waiting for the podium ceremonies, Van Loy spent some time chatting with Dan Dombroski, the brother of Amy Dombroski and co-founder of the Amy D. Foundation with his wife, Nicole Novembre. As a member of the Telenet-Fidea team Amy enjoyed the support of a fan club in Hoechst, Belgium. After the accident that claimed Amy’s life, the club moved to support Van Loy when she signed with the team. Telenet-Fidea Cyclocross Team remains in Boulder for the next two weeks. Racing in the Colorado late summer furnace should set Van Loy up well for the desert heat at CrossVegas on September 16. 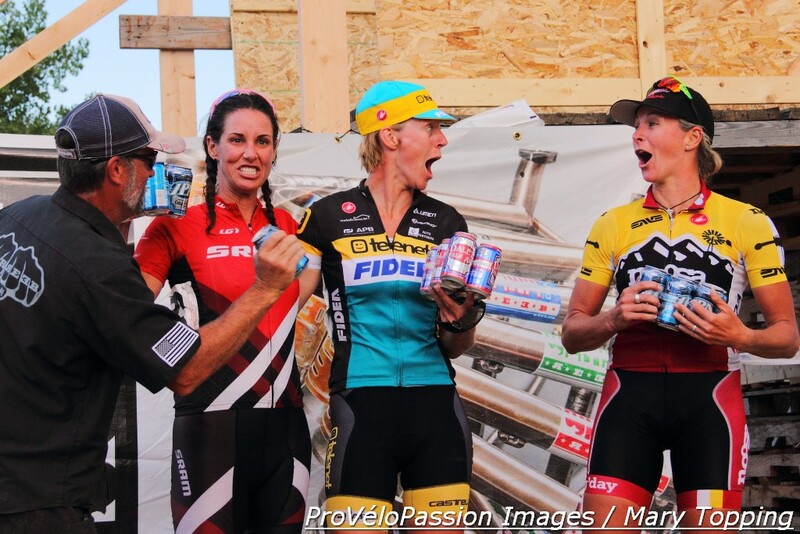 The event was also the scene of a big announcement for the Noosa Professional Cyclocross Team: the squad of Miller and Allen Krughoff has secured a new sponsor, Longmont, Colorado based Oskar Blues Brewery.